Since I got you all excited about creating your own patterns - from a pattern that already fits you - in my last post, I thought I would give you some fitting thoughts of what I went through with my versions of McCall's 6649. I posted an update about the Craftsy class with Sarah Holden in my last post, but I thought I would state it again. This particular class does not offer any help whatsoever for fitting. It focuses on pattern drafting from a pattern that fits you. The fitting process is a whole class unto itself, so that was not covered in a class like this (but see below for more info on my fitting references). Often times fitting, for me, is a really rotten and time consuming process (isn't it for everyone?). One thing I really really don't enjoy is that I tend to start second guessing myself at the end of it all. Do I really like the fit of this? Maybe I should make a few more tweaks? Shouldn't it be more fitted? Hmmm, the sleeve might be an 1/8" too long? An 1/8"? Isn't that a little nuts? Are we actually trying to split hairs here? AHHHHH! This process is called overfitting and it happens, I think, to all of us (well I hope it does or I am a bona fide nut job). I usually have to step back from something like this and then come back to it a few days or weeks later. With McCall's 6649, I made an initial muslin. 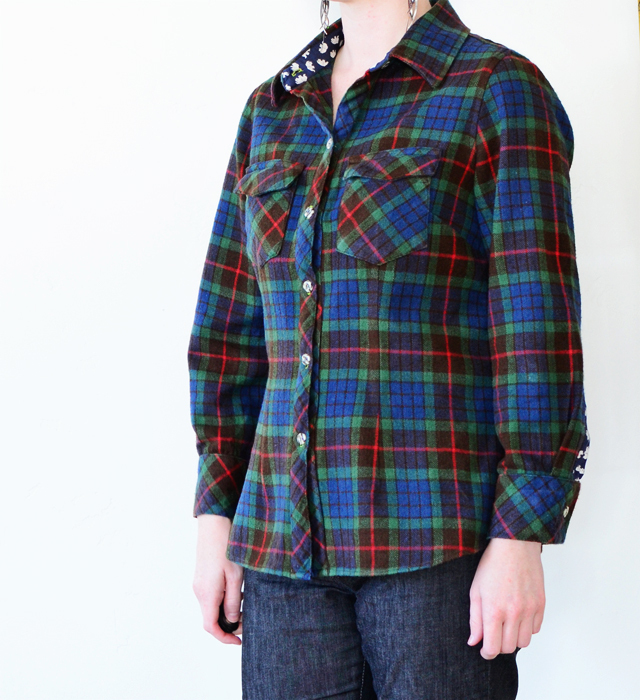 From there I created this flannel shirt. That was my first rendition. The sleeves were too short, the collar was too tall and flopped about too much (for my taste). The shoulders needed a forward shoulder adjustment, the sleeve cuff was too big. I also like to sew the button placket in a different way (this is just too lumpy for my taste). These were things that needed fixing even after I had done a muslin and made extensive fitting adjustments before I made up this version! In case you were worried, I didn't pick this pattern back up and finish the fitting process until December 2014. It did not take me since last August to fit this pattern! Ha ha! Now that would be bad! My second round proved better. I measured a sleeve and cuff from a button-up shirt I had and liked the fit of and then adjusted my pattern accordingly. Also compared the collars and made more adjustments to my pattern. The sleeve cuff on this one still ended up being too big for my taste preferences. And yes, I totally added lace to this one! 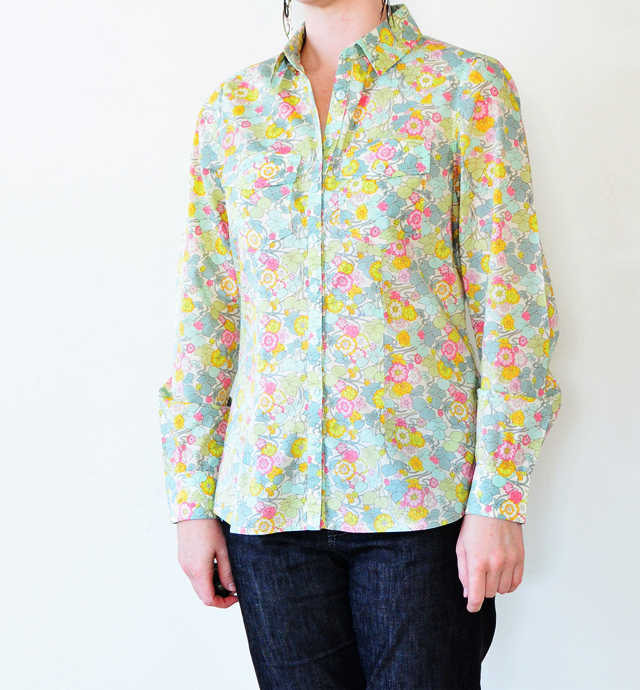 This is a Liberty of London print, just in case you were wondering. I adjusted the sleeve cuff for this favorite version (read more about this one here)! The cuff is a little more fitted and that's exactly the way I like them. This shirt, I daresay is perfect. Again on this shirt, I opted not to sew in the vertical darts on the front bodice, just to mix it up a little. I like things boxy sometimes and I was curious to see if it still "fit" if I didn't sew in the darts. It fits just fine, it's just a different sort of fit which is good because then the wheels start turning and I start seeing possibilities for future hacks! And then just to be safe, I made one more version in a most beloved Liberty of London that I had been stashing for some time for just this very purpose. I decided to go whole hog and do all of the things, including front vertical darts and pockets with flaps. I decided to show you all of these because I feel that sometimes people might think that fitting can be solved after one muslin iteration. While a lot of it can and the garment you make next is usually just fine or at least wearable, you'll end up wanting to tweak things for an even better fit in the next go around. Why? Because you CAN! Hello fitting ninja! The kinks come out of it pretty well when you're into your third make from the same pattern - at least this has been my experience. Granted, there are a lot of patterns out there that I don't make multiples of. Sometimes those patterns are just one hit wonders, but base patterns like these I take a good long time with and really get the fit right on par for what I want. I took this class on Craftsy quite some time ago, which I found to be incredibly useful pre-muslin - Fast Track Fitting with Joi Mahon. Her follow-up class is really good too, Fast Track Fitting, in the Details. She's also got a great book out - Create the Perfect Fit - and all of these resources stick to the same method that she really tries to drill into your brain - measure your body, measure and adjust the pattern. I like her method a lot because you use measurements from your body and then you adjust the pattern before you do your initial muslin. It clears up a lot of the big problems. After the muslin phase, I tweak the fit utilizing the first edition of Fitting & Pattern Alteration. Really, really awesome fitting book. OK, well I think that's enough about fitting for one day. 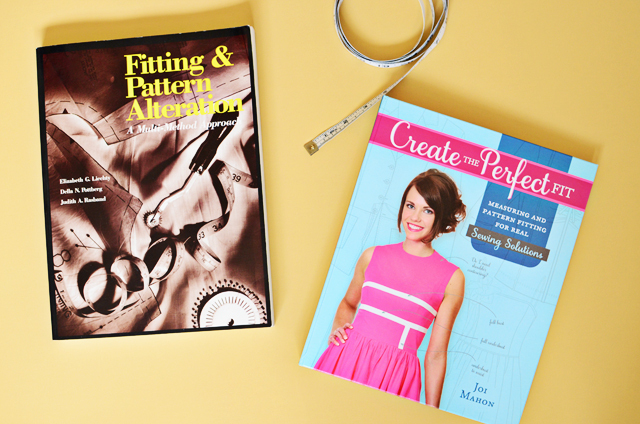 Hopefully there's some good information here for those of you who might be stuck or thinking about overfitting every sewing pattern you've ever made! Do you make multiples of patterns to get the fit just right? Do you over fit? I know, it's totally a thing, right? Overfitting... well now I know what to call it. Fabulous job! I've always stayed away from shirts but this gives me hope. Ain't fitting fun?? I do a regular costuming job where there are one or two repeat performers each year. One has a great figure, but owing to having 2 kids in the past 4 years, her measurements have altered pretty dramatically from season to season! So the muslin that was a dead fit while nursing is too baggy now, etc... I find the best bet is just to cut with very generous seam allowances, and then do a good shaping on the toile before I try to cut out the final fabric. Owing to NO TIME, one toile is all I can allot myself! For personal clothes, yes, I hacked a pair of Ann Taylor wide legged pants and have made 5 different pairs, trying to refine the fit each times. It's fun, and a challenge, as each fabric behaves slightly differently. But I wear them all, because I HATE to toss out anything I have worked that hard on! Thanks for these posts and suggestions. A very valuable resource! Thank you for talking about this scary topic! I'm new to sewing and I made my first dress (out of the envelope) last summer. Alas, it didn't fit and, traumatised, I gave up sewing for several months. I am now getting back into it again and learning a lot about muslin-making and fitting on the way. I now understand that I need to put in a lot more work to get a garment to fit me, and will make up a pattern several times, altering my pattern and tweaking as I go. I've watched both of Joi's classes on Craftsy, as well as Lynda Maynard's fitting class, which is EXCELLENT. 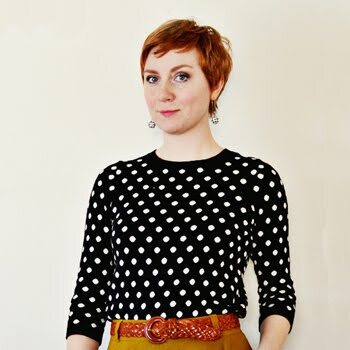 I love your shirts and am excited to start making them once I get my basic cotton tee pattern down! Really good points here! And love your renditions of this pattern. I am doing Suzy Furrer's class on drafting a bodice sloper to fit. I am up to my 12th fitting alteration and am so over it, but want the final result to be bulletproof. I think I could have got there much quicker and with heaps less muslins if I had someone to help me with my measurements. I would also recommend getting an expert to help with the fitting, if you have access to one, which I don't. I just want to get onto the fun pattern alterations bit. Well done on your alterations! I would never have the patience to "tweak" a pattern to the extent that you do. In fact if I had to do that much alterations I'd never start on any sewing project! I prefer to make patterns like "Very Easy Vogue" that have simple lines, are easy to sew so that you can get perfect results. They are elegant and easy to wear. Because they do not have too many pattern pieces are easy to adjust. Patterns like these encourage home sewers whose time for sewing is limited as it competes with so many other demands in their lives. Sewing is a hobby for most people and buying and using a pattern should be a help and not a chore. 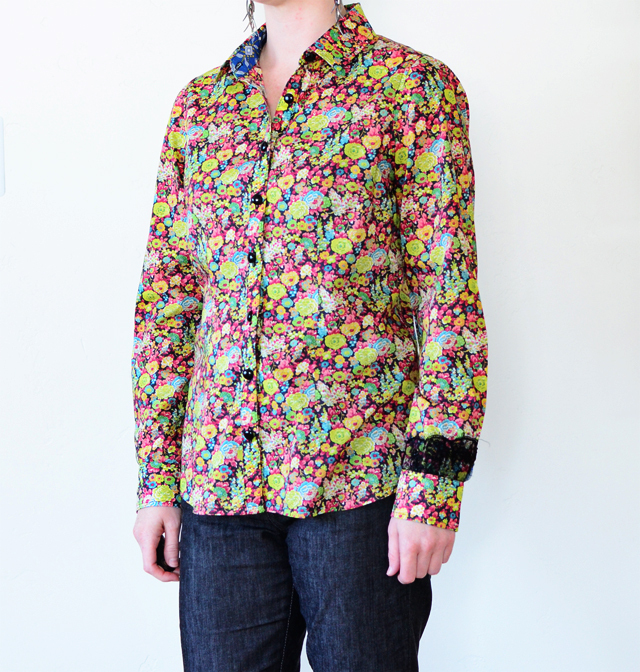 Personally I sew so that I can have my own style which to me means lots of different garments. If I cannot buy a pattern and use it without a muslin first, then I will stop sewing or go back to makng my own patterns which I consider to be a waste of time when there are many good pattern makers out there. I enjoy your blogs and have followed them over the years. I wonder how you find the time to do all the sewing that you do and fit in all the other aspects of your life. Even thinking of all the time you spend on recording your work alone! I'm retired, and do a bit of voluntary work, but that aside, managing a house and garden doesn't leave as much time for sewing as I would like. I really appreciate you sharing your process. I have been inspired to make and fit a button up shirt. 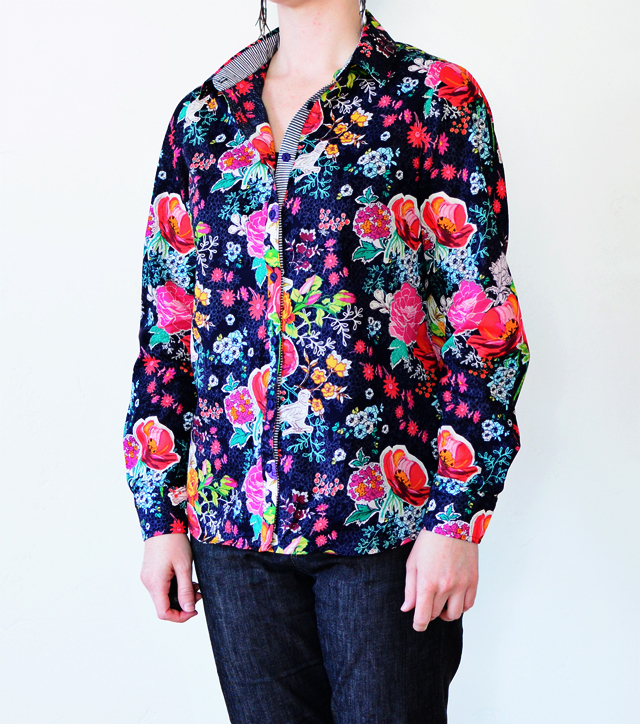 I got the McCall's pattern, sign up crafty class by Pam Howard and on my way many fantastic shirts that fit me. My journey there will take effort and time with fit but that's what it takes. It's also really good to be reminded that you'll need to continue making changes, even after a muslin - you may only realise something needs to change after wearing something for 5+ hours, or once you've got it in a fashion fabric rather than stiffer muslin. Thanks for sharing your fitting process, I made a muslin for a few shirt patterns last week and you've just convinced me to sign up for that craftsy class. Please can you share with us how you get the collar to stand up like it does. I've got a shirt pattern I'm really happy with except for the collar - it opens out and lies flat and I don't want that. Kate, don't forget you can ask Craftsy for a refund if the class is not your cup of tea, I think you have 30 days. I bought Joi Mahon's classes and just don't feel any closer to a good fit. Her teaching style is not my thing and there have been other Craftsy classes I preferred for fitting like Kathleen Cheatham's. What an awesome post! I love what you've done with this pattern and am inspired to try myself. Thanks for that! My question to you: I really love sleeves with little turn-up cuffs (maybe)that fall at or just below my elbow - and I'm thinking of trying to do this with this pattern. Do you have any suggestions or advice you could share for doing something like this? Thanks! Just had to jump in and say I was skeptical of yet another fitting book but entered a giveaway because why not? Joi's book was a revelation and has tremendously helped my fitting journey! Thanks for your honesty in sharing the journey it takes for that "perfect fit". 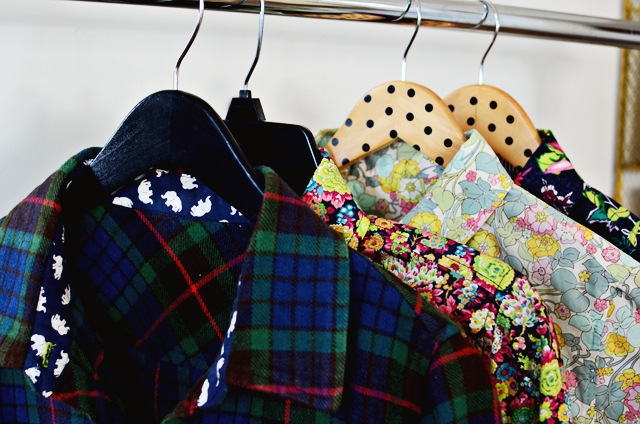 Love that navy floral shirt too! I suffer from being formerly fat. The yo-yo of weight loss and subsequent gain has been a steady pattern in my life for over 30 years with a size 18 at my largest and 10 at my smallest. Fortunately, the 18 was for a very short time in my late teens, but also unfortunately, in the size 10 phase I bought a ton of clothes that no longer fit. So now I'm making my own and have found out that somewhere between a size 12 & 14 is perfect (at a size 10 my face has too many wrinkles!) I'm using RTW dresses that I like as sizing guides to alter commercial patterns - the bodices on some and skirts on others. But even then, something usually goes wonky. Measurements be what they are, I NEVER believe them and so I "add just a 1/2" here" and I end up with a billowing tent in the end that I have to add a dart to. It's definitely a journey! That last LoL blouse is my favorite. Beautiful! Great points! Sometimes there are certain patterns that I only want to make once. I don't need to make it multiple times so, one muslin is going to have to be enough. In that case, I find that some of the fitting problems will just have to stay, but at least it's mostly wearable and I will wear it. DIfferent fabrics do bring up different fitting problems, couldn't agree more! So in addition to the pattern, now we have to worry about fabric! Ugh. Never ending! I love this thought about our preferences changing. So true. There have been times in my life that I've preferred an really close fit and other times when I've wanted a slouchier fit on a similar silhouette. Great thoughts! I tell this to all of my students. Fitting is the #1 reason people don't sew their own clothes anymore. It's the #1 reason we give it up and never want to do it again. On the flip side though, when you've gotten a better hang of the fitting game, it's the #1 reason you will sew because you'll find that once things start fitting, you'll love it! Hang in there. This is what most everyone goes through. Wow. Yes, you would definitely want the fitting to be bulletproof. Again, I'm always amazed that there is really no "easy" path to fitting. You just have to go through it and do it and keep doing it. I think you have to approach sewing from what you want out of it and it sounds like you do. I want more from sewing each time I sew - I want to make easy things and hard thing. Things that are really complex and others that aren't. I do have a household to manage and I do work a job right now, but I find that I prioritize sewing to be at the top of my list of things to do when I'm idle. I just really crave it and love it. With fitting, I will say that after fitting many different shapes and sizes of women, it would be hard for some to even get many of the sewing patterns with simple lines and shapes to fit well enough to wear or even try on. While this works for you (which is great!) I wouldn't recommend it for everyone because the results vary so much and because then people become extremely unhappy with sewing because they can never wear anything they make, which is incredibly frustrating. In my opinion, fitting is just one of those things that you have to do if you make your own clothes. Again, a great point. The wearing of something for a day really tells you if it's going to work for you. Sometimes it really doesn't. I just made a pair of jeans and the waistband is digging into my tummy - won't wear them! So out they go and here I go making another pair with a waistband adjustment. Oh, I'll have to check out Kathleen's class! Thanks for the tip! I personally really really like Joi's method. It's a method I was doing before I had encountered her class on Craftsy, but on a much simpler scale. She has you take a lot more measurements and you make a lot more adjustments and it's been something of a revelation for me. I still have some issues after the muslin, but they are fairly minimal. I find that the her method works really well on other women as well as I've used it for my fitting classes. This is another great point! I think a lot of women suffer from rapid weight loss and gain and it can be really hard on the fitting front because you have to take your measurements each time you approach something new. I think you've got a great system - using RTW can be a revelation to making sewing patterns fit. Great idea! © A Fashionable Stitch. All rights reserved.